But in between towering pinnacles, the elements have carved out rich grassland arenas full of life. This is one of the last remaining outposts of the prairie dog. Once, they lived across the Americas and numbered over five billion. Today, they have been decimated to just two percent of that. Driven from ever-growing human populations and poisoned by ranchers, this exiled community is like a group of grizzled prospectors determined to survive off the land. But the prairie dogs aren’t alone. In the heat of spring and summer, the Badlands become a boomtown. Other animals are drawn to the prairie dogs keen to exploit, steal and scavenge their riches. By day, howdy owls chance their luck by thieving the prairie dog burrows to raise their own chicks; by night, black-footed ferrets, with eye-patches like bandits, launch raiding parties to hunt down prairie dog young. Once a year, like drunk cowboys smashing up a saloon, giant American bison can trample in the prairie-dog burrows as they fight to attract a mate. When the prairie dogs aren’t busy trying to survive the carnage – or run their enemies out of town – they make the most of the lush grasslands and occasional rains to raise families of their own, often fighting amongst themselves over the best patches of land. 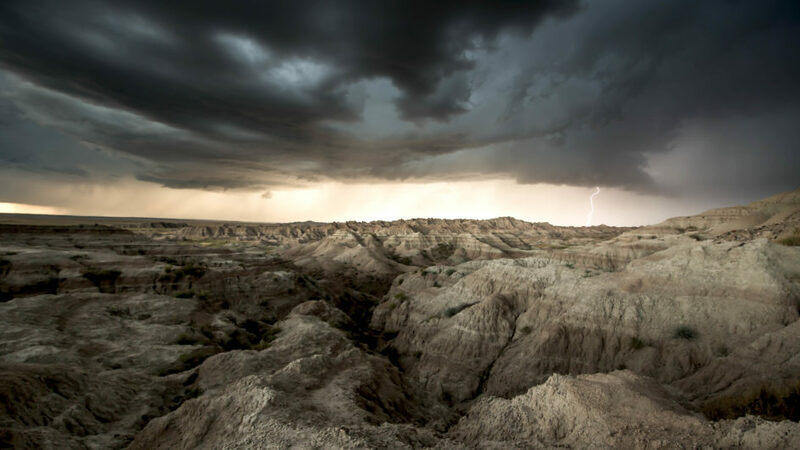 Badlands is a place where savage beauty is born from harsh extremes. To the Lakota Native Americans it was called Makhosica, which means “bad land,” and the first French Canadian fur trappers knew it as “Les Mauvaises Terres a Traverser” which means the Hard Lands to Cross. Today, there’s a new, sinister arrival lurking in the grasslands of America’s great wilderness: the plague. Like an invading army it is marching through the Badlands and could wipe out 90 percent of the prairie dog town. An ecological wilderness is under siege and there’s no way of knowing which animals will survive. A production of Terra Mater Factual Studios and National Geographic Channel in association with Smithsonian Networks produced by Mike Birkhead Associates Ltd.